The World Cup has to be one of the biggest Snack-Fests in the world calendar. All over the world grown and not-yet-grown men are grabbing grub (and maybe a beer or two) whilst they cheer, gasp, weep, boo and cheer again. Whilst I don’t entirely get it myself, I do like to feed people. And it has to be said it would be kind of cool if either of our countries (UK or Iran) win. Just take one large, soft (malleable rather than brittle) flatbread (we use markouk – which, yes, handily we sell in our shop). Spread it with something spreadable: we used red pepper houmous for our colours-of-Iran themed number above, but you can use any dip, or labneh, or pesto, or yoghurt, or chilli sauce. Be careful to take the filling almost to the edge, otherwise you will end up wasting a lot of bread. Add something with a bit more substance (we used feta above – but you can use smoked salmon, ham, chorizo, fried aubergine, grilled peppers….). And then pile a load of herbs/salad leaves on top – we used fresh mint and Peckham mesclun (for real – we are now buying Peckham allotment produce). 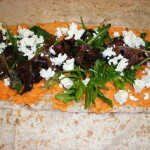 Roll the wrap tightly, tucking in any escapee ingredients as you go, and then cut it into rounds along the length. If you’re not too hot on the wrapping front, you may need to use cocktail sticks to pin the pinwheels together. That’s all there is to it. Cool, no? You’re welcome. 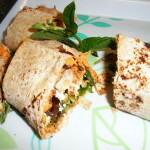 This entry was posted in Recipes and tagged flatbread pinwheels, pinwheel sandwiches, World Cup food on June 16, 2014 by Sally Butcher.